A group of scientists from the Carnegie Institution and Russian Academy of Sciences report in this week's Nature magazine the surprising observation that sulfur becomes a superconductor at 93 GPa (930,000 atmospheres). At this pressure, pure sulfur transforms to a superconductor with a Tc (critical temperature) of 10 K, or -263 C. As pressure increases, so does the superconducting temperature, at a rate of .06 K per GPa (up to 14K). At a pressure of 160 GPa (the highest measured in the current experiments), Tc again increases to 17 K. In a related study, appearing in this week's Physical Review Letters, the same authors report the first measurements on a known superconductor, the metal niobium, above one million atmospheres (or one megabar) to 132 GPa. A material is said to be a superconductor when it loses resistance to electrical current flow. The phenomenon, one of the most non-intuitive in physics, has been recognized since 1911. Within the last decade, superconducting materials have been found at temperatures high enough to hold promise for energy-related applications, especially in the computer and electric energy fields. Most studies have focused on oxide-based ceramics. The mechanisms of superconductivity in materials are of great theoretical interest but are, in many cases, in dispute. Studies of simple materials such as the pure elements that might superconduct, including an examination of the effects of pressure on Tc, are essential for understanding the underlying physics. Such studies in turn are crucial for designing new, technologically useful superconductors. The authors of both papers are Viktor Struzhkin, Russell Hemley, Ho-kwang Mao, all of Carnegie's Geophysical Laboratory and NSF Center for High Pressure Research, and Yuri Timofeev, of the Institute of High-Pressure Physics, Russian Academy of Sciences. The group used the Geophysical Laboratory's megabar high-pressure diamond-anvil cell in conjunction with a magnetic susceptibility technique they have perfected over the past few years. The technique allowed them to determine the superconducting transition temperature without the need for placing electrical leads on the sample. Thus, they could perform their measurements on very small samples (down to 0.04 of a millimeter in diameter and a few thousandths of a millimeter in thickness). Tests of the method in the megabar pressure range (above 100 GPa) were done on niobium, which has a Tc of 9.5 K at atmospheric pressure but decreases to 4.5 K at 132 GPa (rather than increases). Sulfur's transition from insulator to superconductor at 93 GPa was unexpected. Several years ago, scientists elsewhere had observed changes in optical properties of sulfur that suggested that the material transforms to a metal at about 90 GPa (at room temperature), with a corresponding change in crystal structure, and that it transformed to another structure at about 160 GPa. 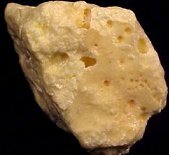 Recent theoretical calculations had predicted that sulfur would become a superconductor only at much higher pressures (above 550 GPa). The new results show that the material transforms directly from an insulator to a superconductor at the first transition (at 90 GPa). The results provide an important example of the large-scale changes in physical properties that can be induced by pressure. The authors write in their Nature paper that their results are particularly notable because the metallic phases of sulfur have the highest Tc's of any elemental solid measured to date. Sulfur now joins the heavier members of its family in the Periodic Table of the Elements (the chalcogenide family, including selenium and tellurium), as a superconductor. This fact should provide critical tests for theories of superconductivity. In closing their paper, the authors write: "Given the comparative simplicity of elemental sulfur for electronic structure calculations and knowledge of its high-pressure crystal structures, this element should provide important tests of possible new mechanisms." The work is part of a much larger effort at the Geophysical Laboratory devoted to studying the behavior of materials at ultrahigh pressures, including those that prevail deep within the planets. The research was supported partially by the National Science Foundation (Division of Materials Research and Center for High-Pressure Research). The Geophysical Laboratory, led by Charles Prewitt, is one of five research departments of the Carnegie Institution of Washington, a nonprofit and educational organization founded in 1902 by Andrew Carnegie. Scientists at the Laboratory perform physiochemical studies of geological problems, with particular emphasis on the processes involved in the formation and evolution of the earthþs crust, mantle, and core. In 1991, NSF established The Center for High-Pressure Research at the Laboratory, a cooperative venture now between Carnegie, SUNY at Stony Brook, and the University of California at Davis.